Oat and Pumpkin Thumbprint Cookies - Made in one bowl, great for snacking for both kids and adults. Naturally gluten-free, nut-free and can be made vegan friendly or raw. 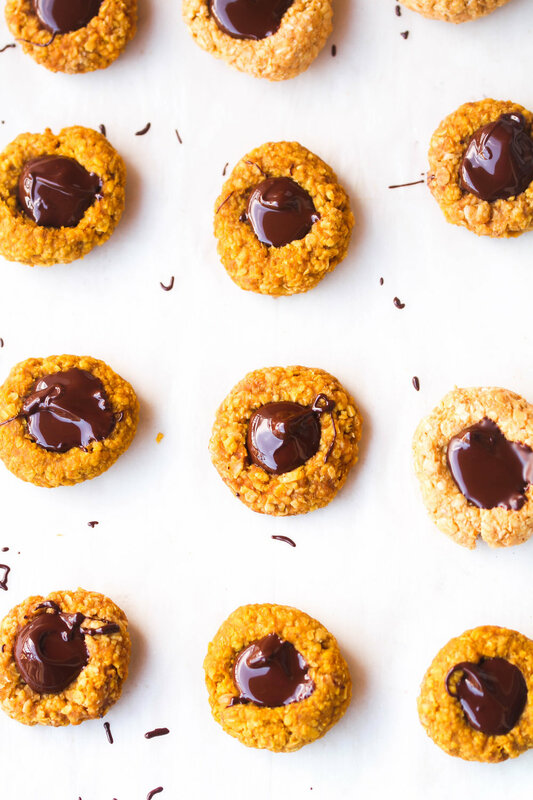 Instead of talking (again) about how much pumpkin and chocolate I ate this past weekend, can we dive directly into Oat and Pumpkin Thumbprint Cookies? These babies are a cross between my Oat & Pumpkin Breakfast Cookies (most popular recipe on the blog) & Pumpkin Pie Energy Balls. Oat and Pumpkin Thumbprint Cookies are perfect for snacking - hello Halloween treat for both kids and adults. It is naturally gluten-free, nut-free and can be made vegan friendly or raw as well in order to meet different lifestyles. As a food blogger, I feel like I need to constantly create new content but I am finding that "it is totally okay to repurpose old content" or "be inspired" by old posts in order to create a new content. The whole idea is to do better whether it is photography, recipe, technique, or the content that you are proud of and will add value to your readers. With Oat & Pumpkin Thumbprint Cookies, I experimented two different techniques (baked vs. raw) so that way, people can you have options. I have 500+ posts on the blog and unfortunately, I forget (or have forgotten) about more than half of them unless we are talking about my go-to weeknight dinner // fav snack // instant iced latte. So, instead of hustling for new recipes, I am changing my focus slightly on 'enhancing old contents' & "repurposing" them so that way it is more meaningful to you guys and a better use of my time too. I hope you will find my notes on Oat and Pumpkin Thumbprint Cookies to be useful if you decide to bake them (or keep them raw). Oat and Pumpkin Thumbprint Cookies are soft to chew, has a mild pumpkin flavor with a chocolate center (which you can easily swap with peanut butter, jelly or whatever you prefer). Center: I filled the center with 70% cacao bitter sweet chocolate from Equal Exchange(made with organic and fairly traded cacao from small-scale farmers in Peru, and sugar from small-scale farmers in Paraguay). You can use your fav. chocolate chips or even nut butter if you prefer. The melted chocolate will harden overtime, so feel free to fill the center right before eating if you wish if you are more into melted chocolate. Preheat the oven to 350F if baking. In a food processor, pulse all the ingredients 2-3 times. If the dough is too wet to handle, add more oats. Line a baking sheet with a parchment paper and keep it aside. Take about 1 tablespoon of dough and roll it into a small disc. Use your thumb to make indention in the middle. Continue with the remaining rough. Bake for 15-17 minutes until it turns slightly golden. Allow the cookies to cool on a wire rack for 10-15 minutes before filling. For raw, leave it in the freezer for 10-15 minutes (thaw prior to using if kept longer) or store it in the refrigerator. Meanwhile, melt chocolate chips in a microwave (or stovetop) at 15 seconds interval. Use a spoon to stir chocolate chips frequently until melted completely. Take a teaspoon and fill the center with 1-1.5 teaspoon of melted chocolate. Allow it to set for few minutes or enjoy it. Store the cookie covered in a refrigerator. Thank you Farmer Direct for sending me your oats and Equal Exchange chocolate to develop this recipe.